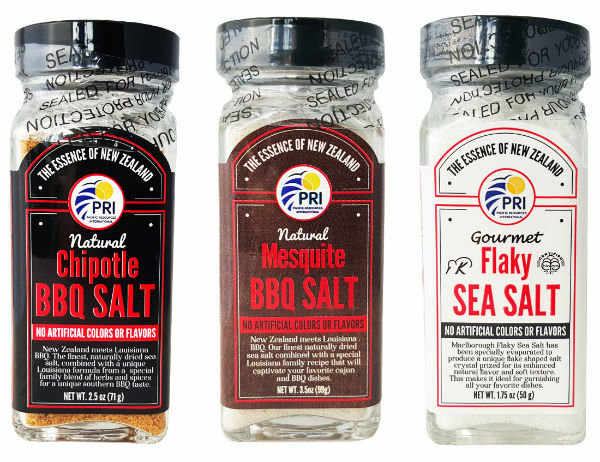 Introducing the latest addition to the PRI Pacific Sea Salt, the Chipotle BBQ Sea Salt. It’s New Zealand meets Louisiana BBQ! Our Chipotle BBQ Sea Salt 2.5 oz is the finest, naturally dried sea salt combined with a unique Louisiana BBQ formula from a special family blend of herbs and spices for a unique southern BBQ taste. Pacific Sea Salt is harvested from the clean oceans that sweeps through Cook Strait between New Zealand’s North and South Islands into the solar field. The waters are evaporated using the natural drying process of the sun and wind for 13-22 months. This drying method helps retain all the sea salt’s natural trace elements that the body needs, including strontium and naturally occurring iodine. The sea salt combined with the Southern Louisiana BBQ flavors results in an amazing sea salt you can enjoy anytime of the year! Pacific Sea Salt contains strontium, which is essential to build strong bones and to help prevent osteoporosis that is common with women and as they age. Pacific Sea Salt is more than just sodium chloride; it has all the natural trace elements in perfect balance. Our Mesquite Smoked Pacific Sea Salt Fine 3.5 oz starts with the clean New Zealand Pacific Sea Salt with no additives retaining all the natural healthy trace elements. Then it’s combined with the secret Louisiana family Smoked Mesquite process to captivate your favorite Cajun dishes. Try giving your next dish a smokey twist with the down home Mesquite Flavor. Our Bio-Gro Flaky Sea Salt 1.75 oz, certified by Bio-Gro (Organic) New Zealand, is the perfect accompaniment to any meal. It is ideal for cooking or as a fancy garnish for all your amazing dishes. The BBQ Sea Salt Collection of sea salt brings a new southern style to Pacific Sea Salt. Get all three sea salt flavors at shoppri.com.